Pope will mark 100th anniversary of apparitions of Our Lady to shepherds of Fatima and canonise Francisco and Jacinta Marto. At 3.30 pm Irish time today Pope Francis will touch down in Portugal at the start of the shortest trip of his pontificate. He will be marking the 100th anniversary of the apparitions of Our Lady to three shepherd children in Fatima, and he will canonise two of them – Jacinta and Francisco Marto. 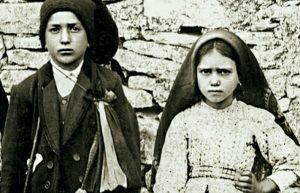 At the time of the apparitions in Fatima, Francisco was nine and Jacinta seven. Together with their older cousin, Lucia, the children were tending sheep in a field called the Cova de Iria. Our Lady appeared to them six times in all, beginning on 13 May 1917. She urged them to pray the rosary and to make reparation for the conversion of sinners, and she called for the consecration of Russia to her Immaculate heart. The Marto children did not live long after the apparitions. In the summer following Our Lady’s last visit, Francisco caught the great influenza and died aged eleven in April 1919, after receiving Holy Communion for the first time. His sister, aged just 10, died from TB a year later. Both bodies are interred in the basilica in Fatima. Lucia lived on to become a Carmelite nun and died in 2005, at the age of 97. Yesterday at the basilica, the Brazilian parents of the young boy whose cure opened up the way to the canonisation of the Marto children spoke to the press. In March 2013 their five-year-old son, Lucas Yurie, was playing with his little sister at his granny’s house when he fell over 20 feet from an upstairs window. The fall caused traumatic damage to his head and brain. He was taken to hospital in a coma. The prognosis was dire – at worst a strong risk of death or being left in a vegetative state, at best, severe brain damage. The boy’s father, Joao Batista Yurie, encouraged his friends and relations and an enclosed order of nuns to pray for a cure through the intercession of Francisco and Jacinta. Within a few days the boy was completely cured. 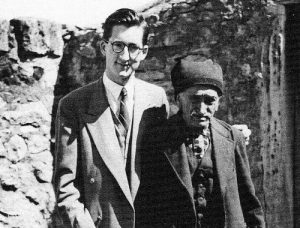 Manuel T. Marto, father of Jacinta and Francisco, with Lauri Duffy in 1954. Speaking to CatholicIreland yesterday from Fatima, Lauri Duffy from Howth, Dublin, who has spent a lifetime dedicated to the shrine and who met the parents of the Marto children in 1954, said the atmosphere at Fatima was wonderful. “Quite a few people have come here from Ireland, although in comparison with the groups coming from Eastern Europe, for example, we are small contingent,” he said. It is a tradition for Portuguese pilgrims to walk to the shrine for the special feast days associated with Fatima (usually the 13th of the month). By Thursday, 45,000 people had arrived on foot at the shrine. “Every time you look out the window, you can see people coming. I don’t know where they are all going to stay!” he said. Caravan and car parks were already full and pilgrims were taking up their positions early for the ceremonies involving the Pope, who will arrive in Fatima around 5.30 pm local time today. His first appointment is a visit and prayer at the Little Chapel of the Apparitions at 6.15 pm. At 9.30 pm tonight, he will bless candles at the chapel, address pilgrims and recite the rosary. Hundreds of thousands of people (up to a million) are expected at the Mass at 10.00 am tomorrow (local time), when Pope Francis will canonise Francisco and Jacinta Marto. They will be the youngest non-martryed saints in church history. In a message in advance of his visit, Pope Francis said he came as a pilgrim of peace and to entrust the world to Mary’s immaculate heart. At the shrine, Pope Francis said he would present Mary with a “bouquet of the most beautiful ‘flowers’ that Jesus entrusted to my care: that is, my brothers and sisters from all over the world who were redeemed by his blood. “I will give you all to Our Lady, asking her to whisper to each one of you: ‘My Immaculate Heart will be your refuge and the way that will lead you to God’,” he said. EWTN will be broadcasting the papal ceremonies live today and tomorrow, beginning with the Pope’s arrival in Portugal.